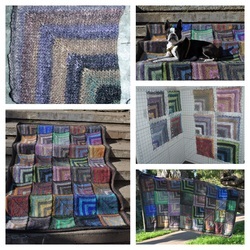 This page offers detailed instructions for some of my favorite projects. Have an idea for a tutorial that you'd like to see created? Send an EMAIL; I'm always happy to hear from you! Show off your steady hand! Painting a wall to look like this is easy, with a few simple materials and some patience. In THIS blog post, I explain the process and even include the template so that you can replicate the pattern. When you're ready, download the pattern template and get started! Shared in THIS post, these thank you cards are easy to make. Read the post to learn how. You'll also learn how I made mine and where some were sent. Take time every day to be thankful, and share your gratitude with those around you without restraint! Feel free to print and give these cards as gifts but please do not sell them.